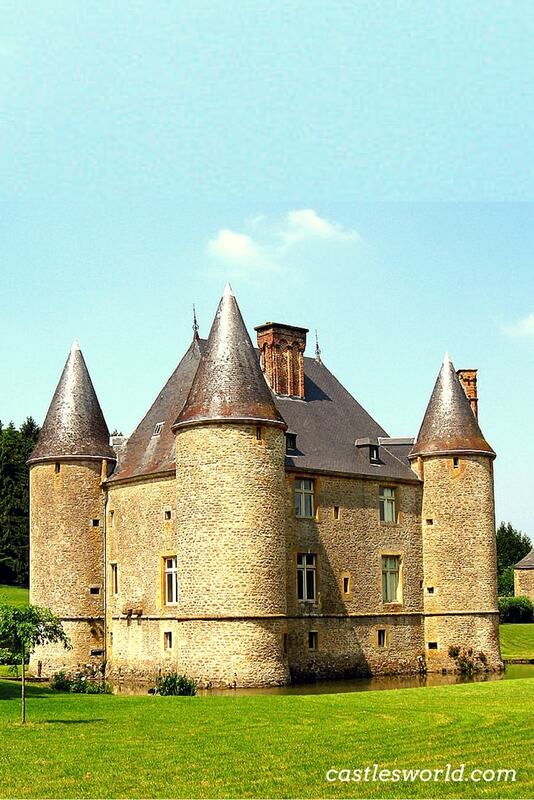 The Castle of Landreville is a charming example of an intact manorial residence built in the pre-Renaissance period in the Ardennes region. It takes the form of a rectangular strong house, flanked by four cylindrical towers and surrounded by water-filled moats, within a six hectares park with green grass, stables and two nice pavilion houses from the 18th and 19th centuries. In 800 years of history it has witnessed the lives of many noble families, including the Landrevilles, Chennerys, Beauvais and others; many wars have started, finished or just passed true here. The current building dates from the middle of the 16th century, but its rectangular plan with four towers designed to provide protection for the four sides has been widely used since the 15th century. This design is characteristic to the military architecture of the 15th and 16th centuries in the Ardennes. There are many elements (such as the main door decoration) that remind the French Renaissance style of the 16th century. Some buildings which surround the castle are more recent, while others located at the south-western entry to the castle were destroyed. Today, the Castle of Landreville is a luxury bed and breakfast hotel.